The Outreach Librarians can conduct evidence searches on your behalf, provide training and information to East Cheshire NHS Trust staff. 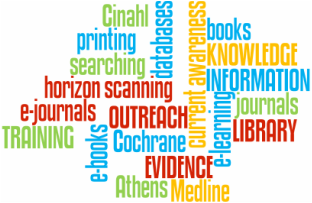 The Outreach Librarians provide free training in evidence searching and using the electronic resources, tailored to your specific requirements. Training can be provided for individuals or small groups, and can be conducted in the Library or at your place of work. Contact Holly or Steve to discuss how they can help you. The Library also send out a daily email of current Health Management news. Use the form below to sign up. To signup for any of our Bulletins and Updates download this form and email it to the Libary. KnowledgeShare is our targeted current awareness service. We'll email you when we find high-impact publications in your area, including guidelines, policy and high-level research evidence. Alerts are emailed out every fortnight. Your KnowledgeShare profile can be created to be as broad or specific as you need. For example, you could receive all alerts on obstetrics or limit to only receive items related to gestational diabetes. KnowledgeShare contains summarised evidence; you will not be inundated with primary research articles. Sign-up for KnowledgeShare by downloading this form and then email or return it to the Library. Follow the Library on Twitter and keep up-to-date with news from the library and relevant health news stories.